Every year the weekend of Thanksgiving, my Japanese great aunts throw a huge Christmas party. The entire family is invited, so it’s a huge day of craziness, fun, and tons of really good Japanese food. I have fond memories of eating sushi and somen salad (somen is a type of Japanese noodle) and watching while all the adults played white elephant. Unfortunately, once I started performing Nutcracker every year the party conflicted with the performances, so I haven’t gone since I was pretty young. I have been craving somen salad for a while now, but I didn’t know what it was called so I couldn’t ask my mom about it. So of course I was elated when I walked into the kitchen a week ago and smelled the dressing! 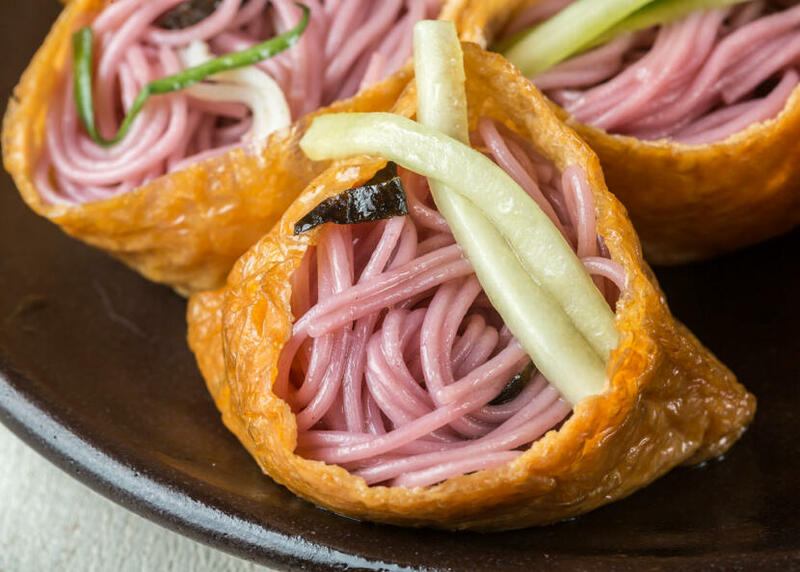 She put the somen salad in inari packets… just when I thought somen salad couldn’t get any better! Believe me… this is heaven!!! I really could eat this the rest of my life… it’s pretty light but still makes a good meal, and it’s sooooo good! Just try it… I promise that you will love it too! Break each bundle of somen noodles into thirds. Boil a pot of water. Add the somen and carefully stir. Drain and rinse with cold water. Mix the sugar, rice vinegar, sesame oil and mirin together in a small bowl. 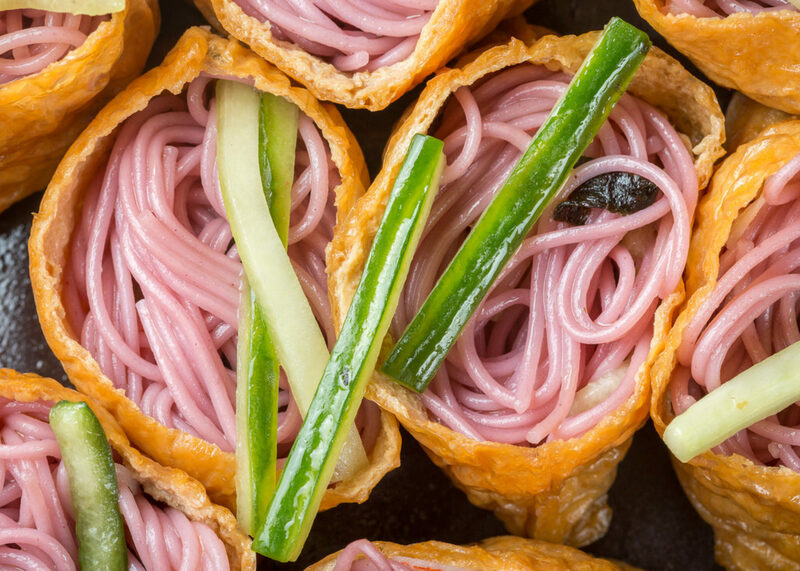 Mix noodles with nori, cucumber, imitation crab and sauce together. Prepare the aburaáge, but don’t prepare any sumeshi. Stuff each piece of aburaáge with about 1/4 cup somen salad. Be careful… the somen salad is slippery so it can be a bit difficult to stuff the aburaáge. I made this yesterday. And again today. Sooo good! I’ve had it for three meals so far and packed it in my bento for tomorrow. I did find that the inari packets overpowered the salad if I stuffed them, so I’ve been cutting them up and putting the pieces on top! Thanks for the recipe! 😀 I love this stuff, and I’m glad to hear you like it too! Isn’t it just soooo good? See, I’m like obsessed with inari so I LOVE the pouches… but I totally understand that not everyone is as inari-obsessed as I am hehe. Sounds like a fantastic idea! last sunday I cooked this sushi receipe for my wife and me. After finishing my wife asked me, when I will cook it again because she liked it so much.